Both retailers are enjoying record customer traffic. But which stock should investors bulk up on? 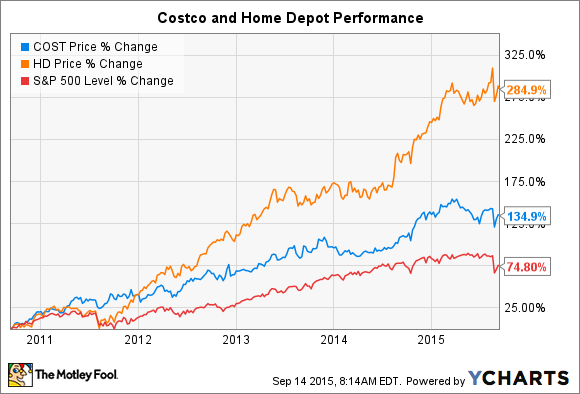 Costco (NASDAQ:COST) and Home Depot (NYSE:HD) stocks are on fire lately -- they've each soundly outperformed the S&P 500's 76% return over the last five years. Costco's bounce has a lot to do with a six-year streak of customer traffic gains that's stuffing its aisles with shoppers. The warehouse retailer's U.S. membership base has jumped to 42 million from 31 million in 2009. Those subscribers are shopping more frequently and spending more per visit than they ever have. Meanwhile, a steadily improving housing market has had the same traffic-juicing effect on Home Depot's business (transaction volume is 3.5% through the last two quarters). Investors have at the same time benefited from a massive profitability expansion: Operating margin has more than doubled from the 6% trough it hit in 2009 to reach a fresh all-time high. Home Depot's operations are chugging along at record levels, but it's what management is doing with those gains that makes this stock such an attractive investment right now. As mentioned above, profitability is at a new high, having leapt from 6% to 13% in the last five years. Return on invested capital, at 25%, is also more than twice what it was in 2010. And other key efficiency metrics are all pointing in the same direction. To name just two more examples, working capital is down and inventory turnover has improved by 20% in the last five years. 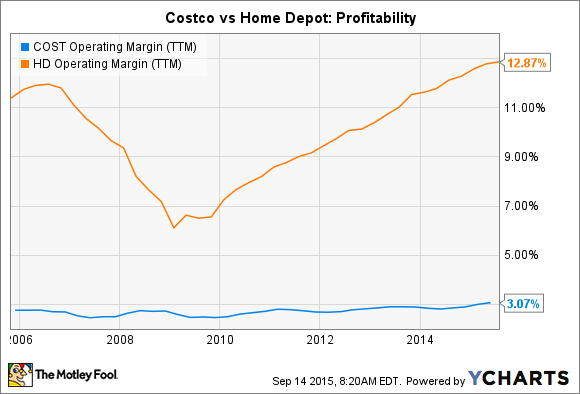 Costco's business doesn't have nearly same level of profitability as Home Depot's. But don't let its tiny 3% operating margin scare you off of this potential investment. After all, membership subscriptions, not product sales, are Costco's main business. And that business is booming: Total paying cardholders rose by 500,000 last quarter to reach 43.7 million. Those members now kick in fee revenue that was up 7% year over year to $1.7 billion, or roughly three-quarters of the warehouser's entire operating profit. The best news for investors about that growing subscriber fee pool is that it is so predictable. Thanks to a record-high 91% renewal rate, shareholders can count on a huge chunk of Costco's earnings streaming in like clockwork, whether the economy stays flat, dips, or surges in the years ahead. The biggest risk when buying a high-performing company like Costco or Home Depot is paying too much. Indeed, at over 20 times last year's earnings, both stocks are valued at a significant premium to the market. Still, on that basis, Home Depot and Costco are cheaper than they've been all year, so now could be a good time to start a position if you've been waiting on the sidelines. Income investors might prefer Home Depot thanks to its hefty 2% dividend yield and fast-growing payout. But if you're after profits you can rely on through major market swings, then Costco is your better bet.